Moyea MKV Converter for Mac is a necessary and ideal MKV conversion tool for Mac user. With it, you can convert tons of MKV videos to MOV, MP4, AVI, 3GP, MP3, AAC, M4A, AC3, MPEG, etc for playing on your iPad, iPod, iPhone, Xbox 360, Apple TV, etc. The high speed and wonderful quality is beyond your imagination. The program interface is beautiful and intuitive. You can use it easily at the first second. 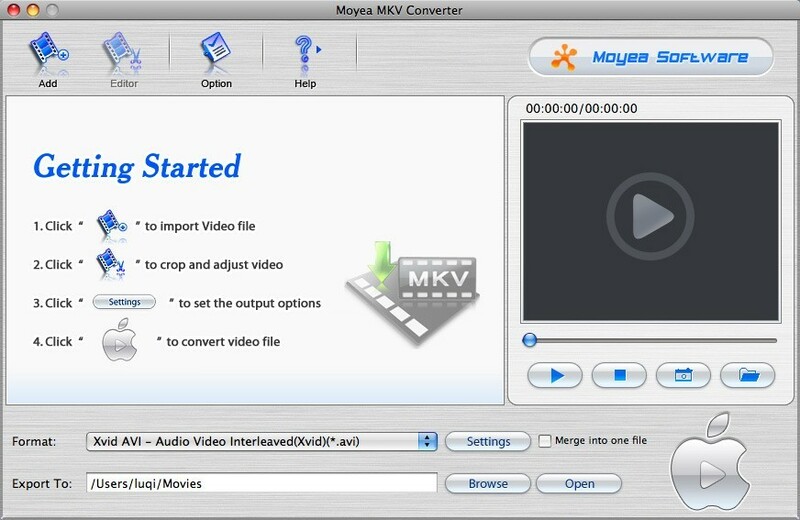 1.Moyea MKV Converter for Mac can convert MKV to MP4, MPEG, MPG, AVI, 3GP, 3G2, MOV, TS, WMV, MP2, WAV, OGG, ASF, AC3, MP3, etc. So you can watch the videos and movies on your portable devices like iPad, iPhone, iPod, Xbox 360, PSP, Apple TV, etc. 2. This program is a easy to use software and you can become an expert on operating it for the first time. And let you save more time for the conversion. 3. Moyea MKV Converter for Mac optimizes all the output profiles with diverse resolution, and classified them by different multimedia players to make you find the best format easily. 7. Save the attractive images in the video for collection on your PC by means of using the snapshot function. Select the audio track from your PC to replace the original one to meet your special needs. 8. The Mac MKV converter provides you with green codec environment because of its built-in codec. That is to say, it will not install any codec on computer, which will avoid the unexpected codec problem.